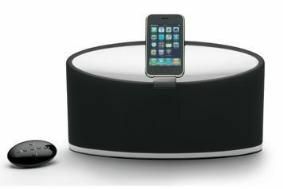 Bowers & Wilkins reveals Zeppelin Mini iPod dock | What Hi-Fi? Now it's joined by its younger brother, the aptly-named Zeppelin Mini costing £299. The Mini was developed by the same engineering team behind the original Zeppelin, but has a couple of new features. The docking arm can rotate by ninety degrees, so you can display the screen on your iPhone or iPod Touch vertically or horizontally. And the addition of USB connectivity means users can bypass the analogue output stage of any iPod, and use the Mini's built-in Digital Signal processing (DSP) instead. You can also connect you PC or Mac directly to the Zeppelin Mini via USB and play your music files through it, rather than using your computer's speakers, as well as syncing your iPhone or iPod with your computer. B&W says its recent development work on DSP technology, on projects such as the in-car system for the new Jaguar XJ, have helped it to create "a clean, room-filling sound with bass levels that have to be heard to be believed". The Zeppelin Mini will be available from October. The original B&W Zeppelin remains on sale for £399.